I was on Andros, the largest of the Bahamas islands doing a story for one of the dive magazines and met an underwater blue hole explorer, Brian Kakuk. We went to the Conch Sound Blue Hole so I could get some photos of Brian for the story. Here, he's getting ready for the dive. I went into the hole as far as my cavern training would allow doing the underwater images. Brian did his exploration and I waited at the surface; we cleaned up and made our way back to the Small Bay Hope Lodge. 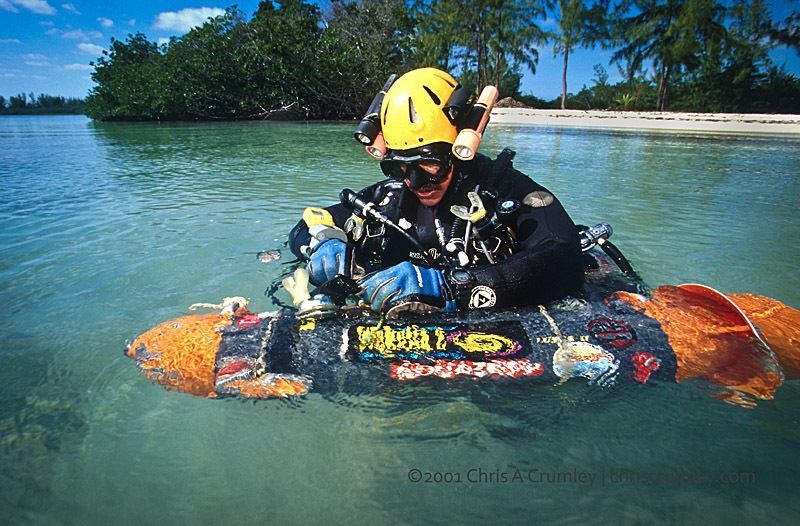 We stayed in touch and Brian led another friend, Wes Skiles, into some of the Bahamas Blue holes for a stunning National Geographic cover story in the August 2010 issue.